The color of T-shirts people wear affects escape behavior in western fence lizards, according to a study published August 9, 2017 in the open-access journal PLOS ONE by Breanna Putman from University of California, Los Angeles and the Natural History Museum of Los Angeles County, U.S.A., and colleagues. Animals often see people as predators, and animal behavior can be affected by nuanced aspects of human behavior including gaze direction, camera shutter noise, and clothing color. For example, several species of birds with orange or red body patches are more tolerant of people wearing orange or red. This tolerance has been explained by the species confidence hypothesis, which suggests that birds are less fearful of colors found on their own bodies. However, most of these bird studies tested responses to observers wearing bright orange versus dark gray, making it impossible to determine whether the birds responded to the color itself or to its detectability against the background environment. Putman and colleagues tested the species confidence hypothesis further on western fence lizards in Southern California. Males of this species communicate with blue patches on the abdomen and throat. Putman wore T-shirts of different colors ? dark blue, light blue, red and gray ? and measured how close she could approach lizards before they fled. After they fled, she determined how easy they were to catch. She approached lizards that were already used to human presence as well as lizards that had little experience with humans in their protected nature reserve. Altogether, she did nearly 30 trials for each T-shirt color. In addition, the researchers used reflectance spectroscopy to determine the conspicuousness of the T-shirts in the environment. 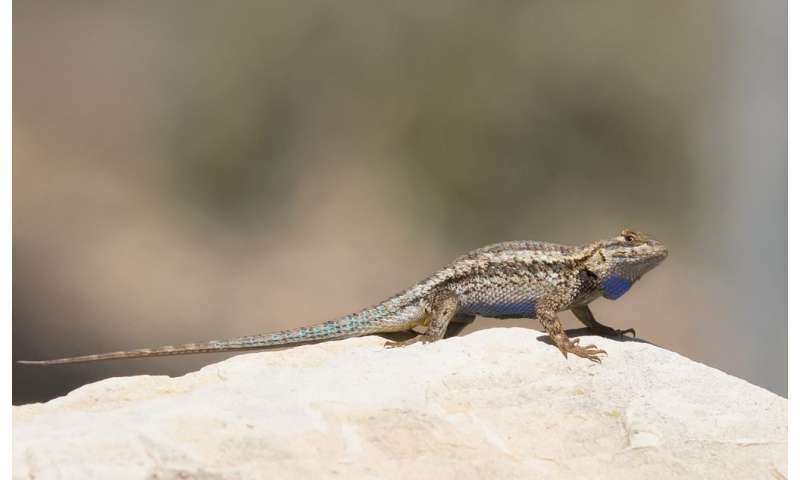 Irrespective of the lizard's previous interactions with human, the study found that western fence lizards are preferentially biased toward dark blue, supporting the species confidence hypothesis. Notably, lizards fled at shorter distances when Putman wore dark blue than when she wore red (an average of roughly 100 versus 200 centimeters, respectively). In addition, she captured lizards about twice as often when wearing dark blue than when wearing red (84% versus about 40% of the time, respectively). Importantly, because the pattern by which lizards fled from different colored T-shirts does not associate with their conspicuousness (based on spectral sensitivities), this suggests that they are responding to color and not detectability. The researchers suggest that the colors scientists wear in the field could affect ease of capture as well as behavior of study species. Moreover, the colors ecotourists and hikers wear could minimize disturbances to animals, which is critical because fleeing long distances when there is no threat could have fitness consequences. As Breanna Putman says: "What we wear can have indirect effects on animals through changes in their behavior."